A - pours a hazy light orange with a white head, some lace and plenty of bubbles. Chunks of yeast on the first pour with half a bottle left. S - green apples and high quality skunk bud, but don't confuse this with the aroma of a dank IPA. T - tastes like a semi sweet Gueuze with green apples and a mild, pleasant skunky-ness in the flavor, but it's not like drinking a Heineken. M - medium body with a lively carbonation. Moderately tart and slightly sweet. O - it didn't taste like I had anticipated, but I was pleasantly surprised with what it is. A semi sweet Gueuze that swapped the barnyard for some skunk bud. Not a good value, but it was a pleasure to try. The bottle is 2+ years old and I think the age helped this one. Pours a golden champagne colour, light bead feeding a fairly stagnant head. White, with decent lacing. Standard. Smell tart. Belgiany. Sharp vinegary acidity, touch of lemon and some Barnyard funk as well. More than tart and more than spice, the essence of weirdness itself. Nice, though. Subtly sweet. Taste is...ummm... smokey? Where the hell did that come from? Tart, balsamic and grapefuit upfront; touch of pearl barley in the middle then weird, woody smoked bacony goodness at the back. Not really a perfect mesh, and what's exciting and novel at first soon becomes quite incongrous. Odd. Sharp tartness upfront on the feel, levels off towards the end. Not bad. An experimental brew, it would appear. Doesn't really work for me, I'm afraid. A: Pours hazy pale orange with a medium off-white compact head. Rather rich lacings. S: Brett!!! But sadly enough also an acetone-like smell overpowers almost everything else. Citric notes way in the back. T: Still "acetonic". Very acidic, it feels alomst like a funky wine. I can't find anything besides the acetone. 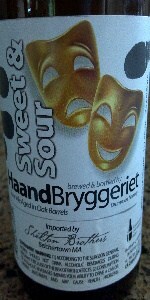 M: Aftertaste is sour and quite short (thank God!). Body is medium and carbonation mild. Bottle purchased for me by @LaitueGonflable, so I thought it was only fair to crack it open with him, and the freeloading @tobeerornottobe. Pours a rather gloomy burnt orange hue, with a fine but insubstantial white head. Lacing is patchy, but solid where the loops stick. Body looks pretty solid and the carbonation is nigh-on static. Not bad at all. Nose is clean, and tart with some green apple coming through along with a weird fudgey sweetness. Oddly rounded, with a slightly meaty hint like honey-soy chicken. Oh my, this is an odd and disturbing beer—and that's just how I like them. Taste starts with a peppery astringency and a hint of limey acidity. Then, whack-bang out of nowhere comes a smoked character that ensures that all bets are off. Did I say this was odd and disturbing before? I didn't even know what an odd and disturbing beer tastes like then. The smoke tingles on the back, but the green-apple acidity still manages to stalk through the haze, leaving a really rather unsettling combination. Whoa, indeed. Feel is light and spritzy, which is just so weird and off the wall—so I guess it fits in with the rest of the beer. Bloody hell but Haand do some fascinating things with beers. What's astonishing is how well they seem to work. This is weird, abrasive and makes me want to have a little confused cry in the corner. Hazy dark golden colour with no head. Okay but nothing special. Pineapple and light balsamic vinegar. Quite acid but one-dimensional. Sweet on the palate with a lactic and acetic tartness that sort of cuts through. Some berry fruits. Okay but it is not great. Medium body with moderately-high carbonation. It's just not that good. The fruit, sweetness and acid lack interest, complexity and punch. 500 ml bottle. Served in a Unibroue tulip, the beer pours a hazy golden/orange color with about an inch off-white head that stayed around a little while. There's a decent amount of lacing. The aroma is nice and tart, it smells like citrus and citrus peel, vinegar, peaches, yeast and oak. It tastes like citrus and citrus peel, apricots, oak, green apples and a bit of vinegar. Not as sour as I expected. Mouthfeel/body is medium, it's a little bit slick and is well carbonated. I think it's a solid, but not impressive brew. For the price, I'm not sure if I'd buy it again or not. $10.98 a bottle. Pours amber in color with an off-white head. The nose is quite citric with lots of grapefruit notes. Some tart raisin character and a light lactic quality. The sweetness is a bit more pronounced than expected with some malt and sweet vanilla aromas. Just a touch of oak. The flavor is a bit on the sweet side up front, but the tartness does take over. Initially, caramel and vanilla along with oak. Light lactic and acetic tartness, lots of citric grapefruit notes, and a hint of stone fruit and grape. Pours out slightly tan with 1/2 finger of off-white suds. Some lacing around the Stange. Smell is sour wood and malt sugars. Mostly a sour malt aroma with little to no alcohol present. Taste is malty and slightly sour. Not a brett sour, just a wood type of sour. No alcohol here either. Mouthfeel is very clean and only the bitterness remains for just a bit then vanishes. \Overall this is a good sour and I will be buying this again. Shared this one during aasher’s wedding week celebration! Served from bottle into a Boulevard tulip. Poured a fluorescent orange with a two finger white head that subsided to a half finger slowly. Maintained phenomenal lacing throughout the glass. The aroma was comprised of sweet malt, sour, tart, citrus, citrus rine, and wood. The flavor was of sweet malt, sour, citrus rine, citrus, fruit, wood, tart, and subtle funk. It had a light feel on the palate with high carbonation. Overall this was a pretty good brew. There was just something about this one that made it so easy to drink. Usually most brews like this don’t have a lot of complexity going on and are rather tart/sour to the point where they cover up a lot of the more modest flavors. However, this one allowed them to shine through while still carrying the tart/sour aspect. Definitely a must try if you have not done so already.